ISSUE IS IN FANTASTIC SHAPE WITH NO TEARS, NO CREASES, NO SCUFFS, NO CUTOUTS, OR MISSING PAGES INNM-9.2 OR BETTER CONDITION. SINCE GRADING IS ENTIRELY SUBJECTIVE, AND I AM NO EXPERT ON GRADING YOU SHOULD CHECK OUT THE PHOTOS PROVIDED TO GET A BETTER IDEA OF CONDITION AND JUDGE FOR YOURSELF. Published 1991 by Marvel. This is a mid grade item. of comics, generally about 25-40 comics depending on page count. Most collectors consider both versions to be of equal value. We buy tens of thousands of comics a month. Published in 1991. (Black & White and Color) Words by Ted Mann with art & cover by Frank Thorne. (check out pics. /excuse glare). In my estimation the book ranges in "NICE" (5.0) VERY GOOD/FINE to (6.0) FINE condition. CONAN THE BARBARIAN # 202- 206. Conan The Destroyer #s 1,2,Complete Mini-Series-F/VF,Combined Shipping! Conan The Destroyer #s 1-2-F/VF. The book is in NM 9.4 condition. The book pictured is what you receive. YOU HAVE COMMITTED TO A CONTRACT BETWEEN MYSELF AND YOURSELF. MY MOTHER COLLECTED A LOT OF COMIC BOOKS. Cover art by Arthur Adams. Red Wind, script by Roy Thomas, pencils by Mike Docherty, inks by Ernie Chan; Conan confronts Thugra Khotan while Red Sonja and Zula battle demons. Published 1991 by Marvel. SIMON BISLEY ORIGINAL ARTWORK VAMPIRELLA, RED SONJA, & DEJAH THORIS 1 WEEK SALE! THIS ARTWORK is One of my favorite pieces of my personal collection. This Artwork was PUBLISHED IN THE SIMON BISLEY 2018 KICKSTARTER SKETCHBOOK, You can refer to the IMAGES. I will have several comic lots up for sale. There are several pictures to get an idea of the condition. The pictures should speak for themselves. I will have several comic lots up for sale. There are several pictures to get an idea of the condition. Marvel CONAN The BARBARIAN #241 Key McFARLANE Cover NEWSSTAND GD 2.0 Ships FREE! I'm not a professional grader but this condition is: Very Fine. Story by Roy Thomas (INVADERS, FANTASTIC FOUR), art by John Buscema (THOR, AVENGERS)! UP for sale is a copy of CONAN THE ROGUE, a MARVEL GRAPHIC NOVEL published in 1991! VF/NM 9.0: Still glossy as new and complete. Conan The Barbarian #241 Direct Market Edition. Publisher: Marvel Comics. Published: 1991. ~ This insures that you get the LOWEST POSSIBLE COST! Grade: NEAR MINT. we are committed to quality service! Published by Marvel Comics in 1991. Written and illustrated by various with "great" cover by Bob Larkin. (check out pics. /excuse glare). Red Sonja story! In my estimation the magazine ranges in "NICE" (4.5) VERY GOOD to (5.0) VERY GOOD/FINE condition. CONAN The Barbarian #241 from Marvel comics. A strictly graded 8.0 / VERY FINE copy. The book is in NM- 9.2 condition. The book pictured is what you receive. See the Photos of the comic listed! Don't trust my opinion, judge the value for yourself. FAST AND SAFE AND SECURED IN A BOX! Zula & Red Sonja appearance! In my estimation the book ranges in "NICE" (7.0) FINE/VERY FINE to (7.5) VERY FINE- condition. Very moderate wear to cover, spine, corners & edges. Both right corners have tiny creases. Solomon Kane story rendered by Steve Carr & Al Williamson! In my estimation the magazine ranges in "NICE" (6.5) FINE to (7.0) FINE/VERY FINE condition. Very moderate wear to cover, spine, corners & edges. Conan the Barbarian (1970) Annual#11. The item for sale here is aConan The Barbarian annual #11I have included detailed scans so you can examine the condition for yourself. Good luck and have fun. I really appreciate the support. #100-Death of Belit! In my estimation the book ranges in "NICE" (6.5) FINE to (7.5) VERY FINE- condition. Very moderate wear to covers, spines, corners & edges. #100 has faint wrinkle at middle spine. THE DEATH OF CONAN! In my estimation the book ranges in "NICE" (7.0) FINE/VERY FINE to (7.5) VERY FINE- condition. Very moderate wear to cover, spine, corners & edges. There are no other glaring flaws/defects/imperfections to note or that is not typical to books falling under the grade ranges indicated above. From Marvel from 1987------------------ --------- --. Revelation in the Mists. ----check out the pic for a great look--------------------------------------------------------------------------------- ----------------------------------------------------- - grade fine-. CONAN THE KING #53 1989 "NIGHT WAR" -THE BARBARIAN- OWSLEY/ ISHERWOOD. =============================================. Conan The Barbarian #209 Direct Market Edition. Publisher: Marvel Comics. ~ This insures that you get the LOWEST POSSIBLE COST! Grade: NEAR MINT. we are committed to quality service! ~ AS ALWAYS, WE TAKE HIGH DEFINITION PICTURES OF MOST OF OUR COMICS ~ For more detail use the ZOOM Function and check them out yourself! The Seven Lives of Thulsa Doom! Riding with Conan's group toward Koth, Thulsa Doom's plans are revealed; Anneka's father, Shapur, gets ever more aggressive. -- ---------- --- ------- ----------- ---------- - ------------ -------------- ---------------from Marvel from 1988------------------ --------- --. Featuring covers by Mike Mignola (236), Todd McFarlane (241), Jim Lee (242), and Wilce Portacio (243). They are in great condition for their age, but not mint. Each issue is of varying good/very good/fine quality, but none are mint. Conan the King (1980) 31-35, 38, 43, 45, 46, 49-53. Conan the Barbarian (1970) 173 VF. 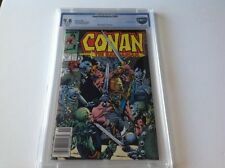 7 issue Conan comic book run from 173-179. I have provided a list of issues and conditions below. Also see the detailed scans for more information. Conan the Barbarian (1970) 179 VF/NM. The issues include; #1 May 1987 (heavy cover wear); #2 June 1987 (only a small stain in one corner of the front cover); #3 July 1987; #5 Sept. 1987; #8 Dec. 1987; #9 Jan. 1988; #10 Feb. 1988; #17 Sept. 1988; #37 Apr. 1990 (staple pulls to cover spine); & #47 Feb. 1991 (wear in a few spots along the cover spine). Conan Saga 19, 30, 31, 33, 37, 42, 44, 57, 60, 77. Average Fine to Very Fine, 19 and 77 are worse and severalbetter. Marvel SAVAGE SWORD OF CONAN (1974) #100 COPPER AGE Key VF/NM Ships FREE!